Services: Local SEO, Map Pack Rankings, Content Marketing. Goal: Achieve rankings for furniture rental terms in 2 different cities. The strategy was to optimize their on-page content and then build links using Black Swan Media’s proprietary knowledge. In addition, we wanted to make sure that their GMB listing was optimized as well. 664% Increase In Organic Traffic. Top 1 Rankings for Multiple Keywords. Before we started our work, the client was getting barely any traffic. Now they dominate their industry for almost all relevant local keywords. 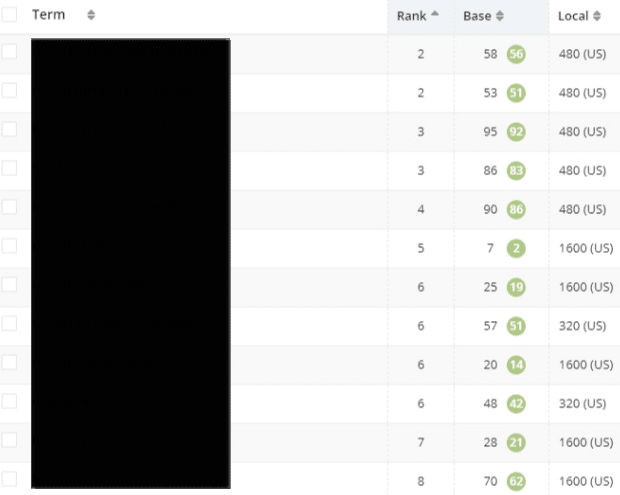 When we started, the client was ranking for their target keywords on pages 5 – 8. After our work was completed they had achieved top 3 rankings for the primary keywords and also ranked for some extra long-tails as well.